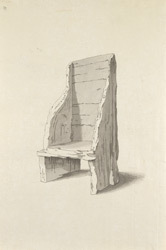 Drawing of a wooden chair, said to be once the chair of the Venerable Bede. This lies in the chancel of St Paul's Parish Church in Jarrow, a village on the south bank of the River Tyne in Northumberland. This church has a 7th century chancel which was originally part of the ancient basilica of the Anglo-Saxon monastery at Jarrow. Bede (673-735) was a monk at the monastery at Jarrow and was famed for his scholarship. He is particularly known for his 'Ecclesiastical History of the English People' of c.731 However, the chair is more probably from the 14th century.